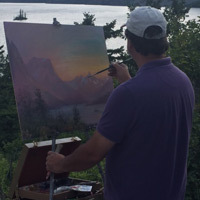 Twenty years ago, inspired by a painting trip to Glacier National Park, he moved to the Flathead Valley and has painted Glacier National Park ever since. Nicholas Oberling’s work is represented in the permanent collection at the Hockaday Museum and has been shown throughout the U.S. Currently Glacier Fine Art Gallery in Hungry Horse is home for his paintings, a studio for classes. His current project is a massive 9 by 14 foot mural commissioned by Freedom Bank in Columbia Falls.